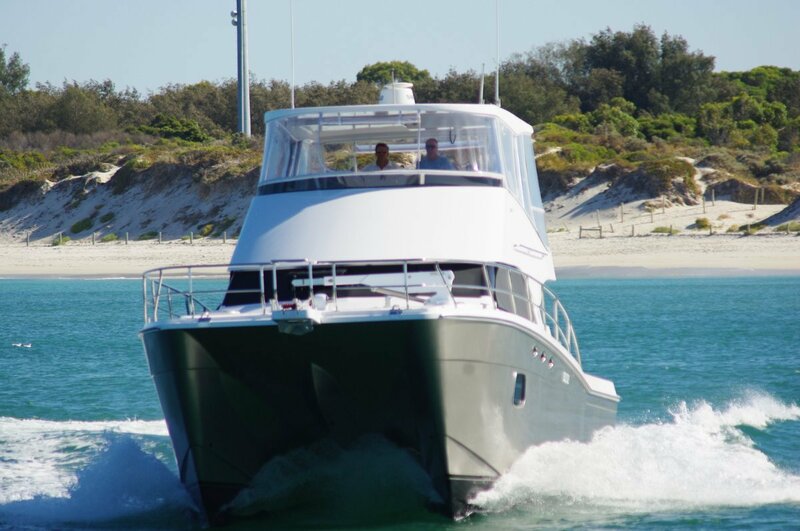 Among the fleet of Rottnest cruisers a 46 footer does not loom large; but a 46 foot catamaran? It is enormous. Lloyd Powell of local builder The Cat Factory usually builds sailing cats, but he admits he willingly went over to the dark side to build this totally custom power cat. Part of the attraction for him was the sheer complexity of a job that required new techniques; part was the building of a one-off in fibreglass to a completely new design. He was fortunate in having a buyer who not only knew exactly what he wanted, but also knew what was possible and practical. The key feature of this boat is daytime space in three areas: saloon, cockpit and flybridge. New Zealand naval architect Noah Thompson provided that in spades, and delivered all the components for the ingenious foam sandwich building system. This has produced a vessel of only 14 tonnes compared with the owner’s previous 40 foot monohull’s 20. Combined with a catamaran’s lower drag and the efficiencies of the Volvo IPS propulsion, the lightness has hugely reduced fuel costs. Most recent boats have moved their galleys to the saloon’s rear, and cockpit barbecues are universal, but this is the first boat I have seen to take the big logical step of linking the two. The saloon’s rear door and window open to the extent that the barbecue unit and the abutting section of galley are the only barrier between indoors and outdoors. Cook outside on the choice of flame burner or plate and pass food through or vice versa; brilliant. 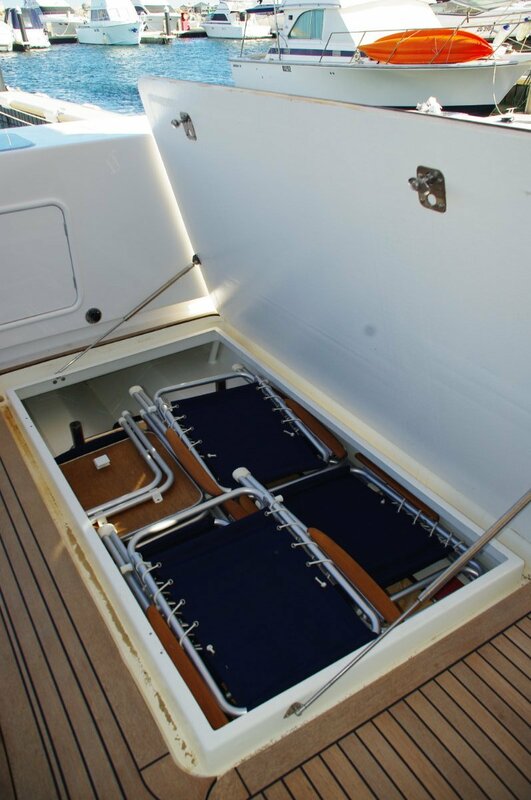 A pleasant feature of cruising cats is the flush deck running all the way from the transom to the forward bulkhead. Coupled with that big opening there is no psychological or physical barrier between main deck spaces. Space is the correct word as clear deck outranks furniture, although there is plenty of that too. Ahead of the galley is a family sized dinette with a settee opposite. 30 or 40 people could sit in or wander the main deck, drinks in hand, without crowding each other. The glazing band is deep and continuous, but recessed to reduce heat gain. 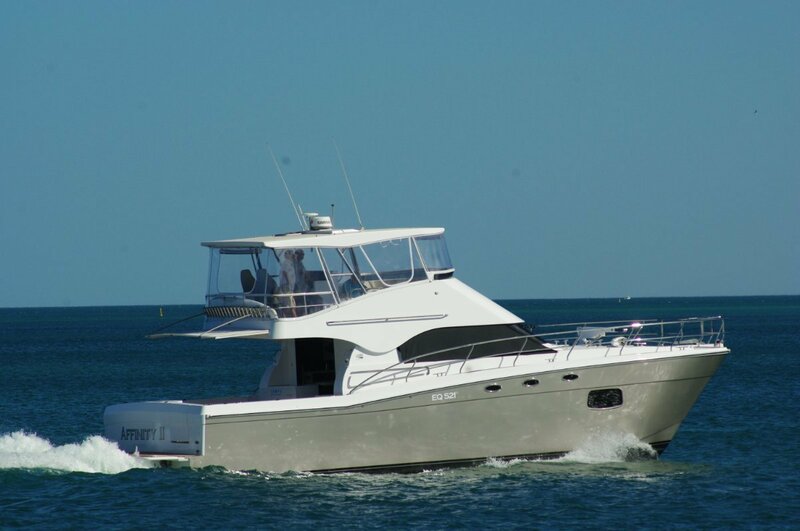 The flybridge is big enough to allow a different generation to entertain friends or simply to take overspill. It has all the trappings of civilization: lots of excellent seating, a wet bar, shade and wind protection plus the single control station. A great deal of control is possible besides wheel, throttle and joystick. The C Zone digital electrics, that link the vessel’s wiring to coupling blocks throughout the boat ,allow control from anywhere of anything using electricity. 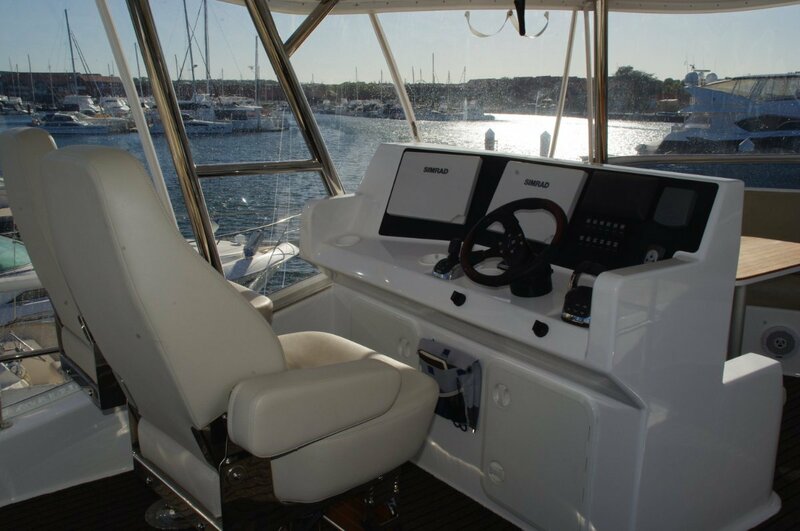 Sitting in the driver’s seat the owner can retract the disappearing saloon TV, weigh the anchor, operate the foredeck davit for the tender and adjust the air conditioning. The rest of the people spaces are within the hulls plus a portion of the hull bridging structure: the sleeping accommodation. The port hull has a double and a twin cabin, the starboard a queen size owner’s cabin and the bathroom. This comprises two distinct rooms, which do indeed have room. The owner wanted good access everywhere and The Cat Factory laid it on. The side decks have easy paced steps up from the cockpit, exactly the right width, and rails for both hands. Like all the stainless steel on board and most of the other components these were fabricated in WA. Perhaps the most striking of the custom features is the finish of the hull. Painstakingly faired to a micron, it has been as near perfectly coated as my eyes could detect in BMW grey. This mystic colour shimmers in different densities and tints as the light hits from different angles.